Polyester comes in a variety of knits, styles and weaves, but this durable fabric has one weakness – snagging. No matter how careful you are, catching your polyester shirt on a ring or any sharp object happens. If you find a snag, resist the urge to tug at it or cut it away with scissors. This can lead to an even larger snag or a noticeable hole in your shirt. Preserve your polyester shirt by patiently working out the snag. In some cases, you may have to take your snagged garment to a professional seamstress for help. Turn the shirt inside out and place the shirt on a flat, clean surface, such as a table or an ironing board. 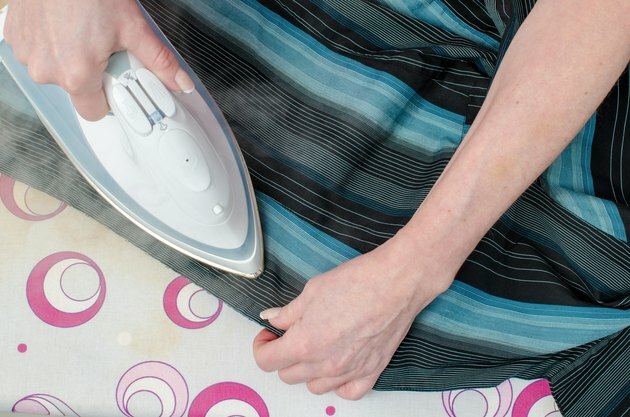 Smooth out the shirt with your hand, removing creases and wrinkles. Examine the shirt for bunching or gathering. Use your fingers to pull around the bunched area and smooth out any puckering. Locate the snagged thread. Poke the smallest loop of the snag with a blunt needle tip. Ease the polyester thread into shape, using the needle head to manipulate the fabric from stitch to stich. Smooth the fabric with your hands. Turn the garment right side out and examine the snag. Set your ironing board to the polyester -- or cool -- setting. Press the fabric to get the shirt back into tip-top shape. Avoid wearing jewelry that can snag your polyester shirt.